I was walking with my friend along the shore at Mount Loretto (http://www.silive.com/entertainment/tvfilm/index.ssf/2009/01/staten_islands_rock_solid_art.html) . 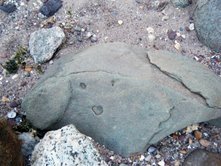 I looked down, and there was a rock, happy to see me! It wasn’t part of any of the sculptures but I consider this my favorite rock, silly as that sounds. When I go back, I know I won’t be able to find him again. But what were my chances of even seeing this rock in the first place? Will anyone find this rock in the many years to come? Either way, it will still be smiling.